NASA Earth Observatory image by Joshua Stevens, using VIIRS data from the Suomi National Polar-orbiting Partnership and the Fire Information for Resource Management System (FIRMS). Story by Adam Voiland. Hazy skies have become an autumn tradition of sorts for the residents of several states in northern India. 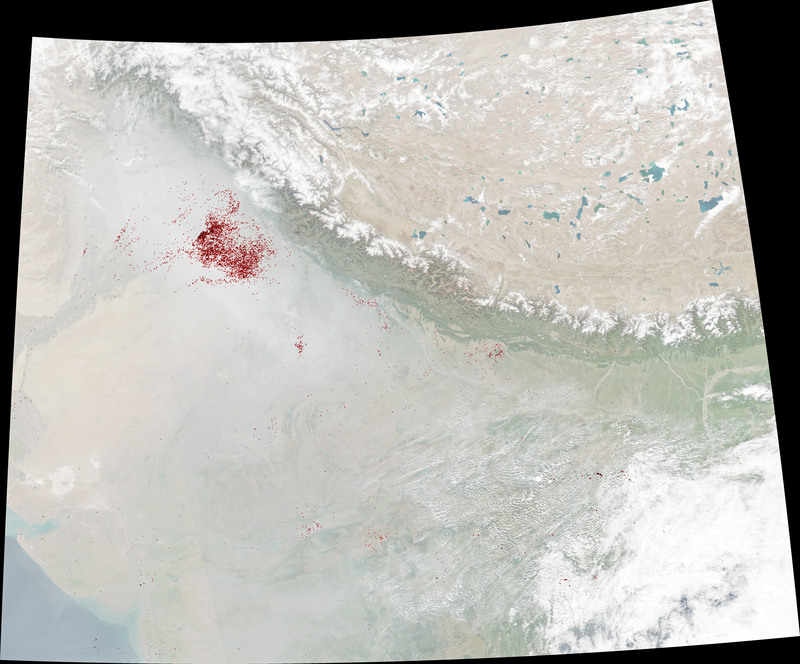 Each October and November, usually around the time of Diwali celebrations, a pall of smoke hangs over large swaths of the Indo-Gangetic Plain. 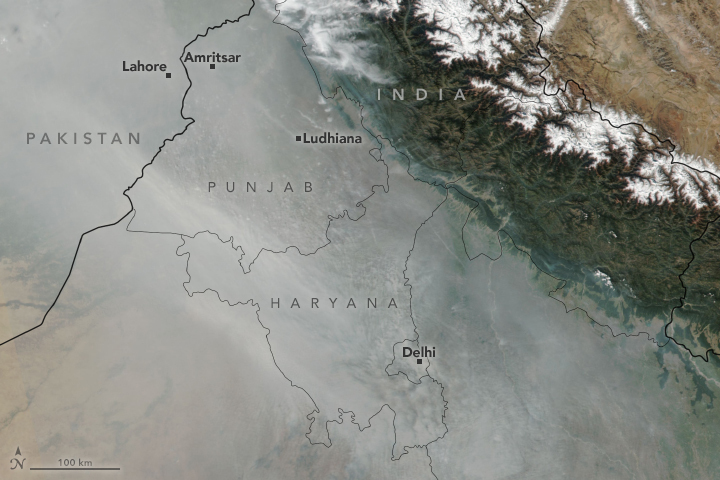 While industrial pollution contributes to the haze, most of it comes from crop-burning—especially in the states of Punjab and Haryana, where rice and wheat are widely grown. Burning typically peaks during the first week of November, a time when many farmers set fire to leftover rice stalks and straw after harvest, a practice known as stubble or paddy burning. Stubble burning is a relatively new phenomenon in northern India. Historically, farmers harvested and plowed fields manually, tilling plant debris back into the soil. When mechanized harvesting (using combines) started to become popular in the 1980s, burning became common because the machines leave stalks that are several inches tall. Burning is considered the quickest and cheapest way to clear the debris and prepare for the wheat crop. 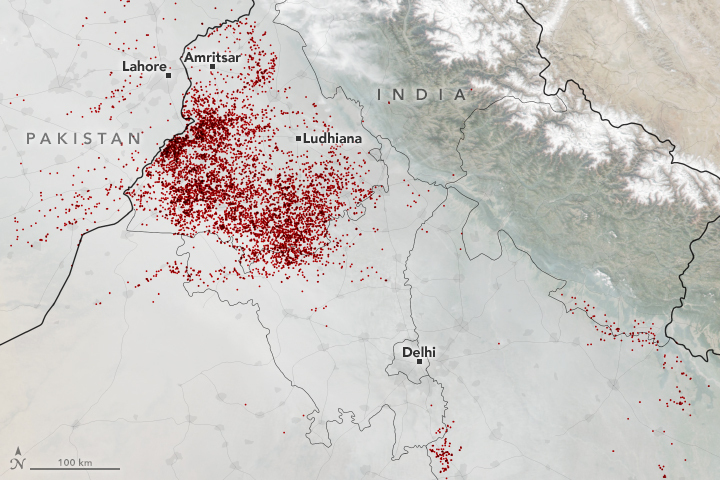 This year, Earth-observing satellites began to detect significant numbers of fires in early October near the town of Amritsar. By the end of the month, large numbers of fires burned across much of the states of Punjab and Haryana. The Visible Infrared Imaging Radiometer Suite (VIIRS) on the Suomi NPP satellite captured a natural-color image on the afternoon of October 31, 2018. The map (second image) shows the locations of fires detected by VIIRS during a 48-hour period from October 30 to November 1. Despite efforts to curb the practice, crop burning is growing more common with each passing year. NASA’s Aqua satellite found a roughly 300 percent increase in the number of fires in the Indo-Gangetic Plain between 2003 and 2017, according to an analysis authored by Sudipta Sarkar, a scientist at NASA’s Goddard Space Flight Center. 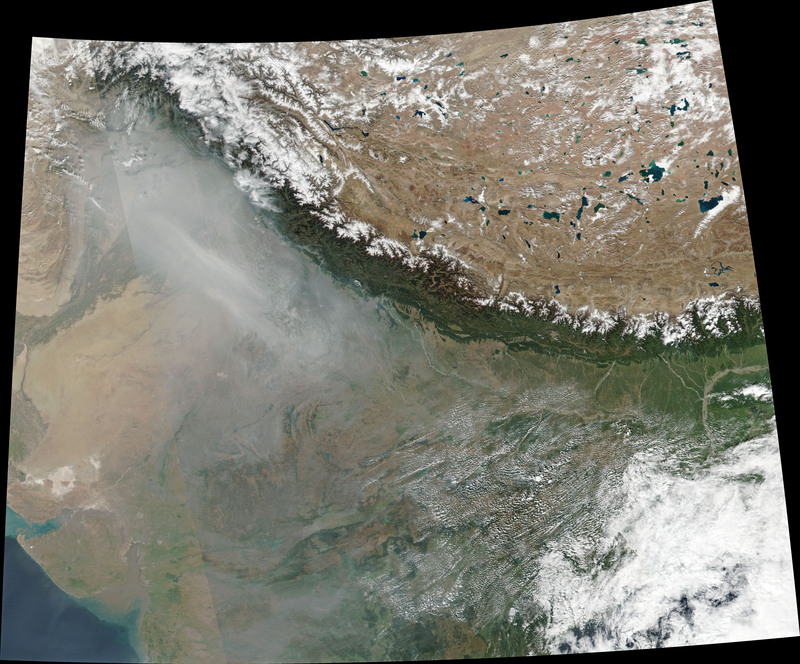 While smoke from the fires has the most direct consequences in northern India, Sarkar and colleagues found that harmful particles and gases regularly traveled several hundred miles from the source, sometimes affecting central and southern India. More widespread availability and use of farm equipment that removes the stalks and shreds the debris could eventually reduce farmers’ reliance on burning. But in the short term, people and other cities downwind ought to be prepared for more smoke. Jethva, H. et al. (2018) Agricultural Burning and Air Quality over Northern India: A Synergistic Analysis using NASA’s A-train Satellite Data and Ground Measurements. Aerosol and Air Quality Research, 18, 1756-1773. Hindustan Times (2018, October 28) Why stubble burning in Haryana and Punjab has intensified in last 10 years. Accessed October 30, 2018. The Hindu (2018, October 27) Punjab’s burning problem. Accessed October 30, 2018. Sarkar, S. et al. (2018) Crop Residue Burning in Northern India: Increasing Threat to Greater India. Journal of Geophysical Research: Atmospheres, 123, 13. The Washington Post (2018, October 15) India is trying to prevent apocalyptic air pollution. Step 1: Stop farmers from burning their fields. Accessed October 30, 2018.